Smashing stuff up can be great fun, but the challenge in building something is often a whole lot more rewarding. Come to think if it, that’s probably why so many people enjoy making their own levels in LittleBigPlanet! When we were kids, some of our favourite toys were those little construction site vehicles that lift and grab things. We could use them to build whole construction sites from bits and bobs lying around the bedroom. So this is what we’ve made, a bunch of construction site vehicles for you to play with and piece together your adventure as you go. The first was the Forklift Truck. It worked exactly how we wanted, but unfortunately it was prone to falling over when lifting a heavy load. So what we did was attach some peach floaty material to each load, to make it a lot lighter and stop the forklift falling over. Just like in real life, the pallet was essential to allow loads to be lifted easily. Next, we wanted to pick up some really big things. So we made the Crane, with a hook. Then we realised that it would be even cooler to be able to pick things up if they didn’t need something for the hook to attach to. So we made a claw attachment and now we can grab almost anything – as long as it’s not gigantic! THEN we thought it would be great to make something which would allow Sackboy to reach new areas and move things around with him, so we made the platform attachment. 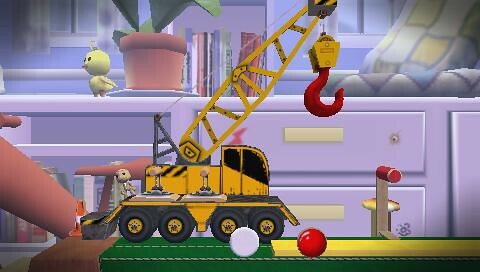 Finally, we wanted something to act as a wrecking ball (because we just couldn’t resist a little tiny bit of smashing things up), and had lots of fun attaching random objects to the crane arm with a winch, like wheels from other vehicles, toy soldiers etc. So we thought we’d leave you to do the same. 1.) Sackboy could get into easily. 3.) Looked like a cement mixer. But we cracked it. 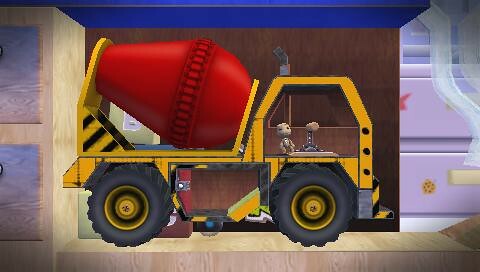 The cement mixer’s probably the largest vehicle in the entire pack, with wheels that are about twice the size of Sackboy himself. The Monster Truck doesn’t even come close! Okay, we can pick things up and move them around, but what about using a smaller vehicle? It’s bulldozer time. But this is no ordinary bulldozer. What we really needed was to be able to move things around and then put them behind the bulldozer itself. 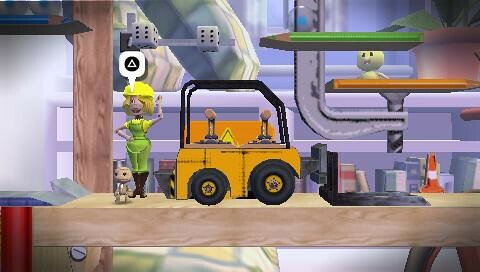 Now, real bulldozers can’t do that, but in LittleBigPlanet, pretty much anything is possible, right? This bulldozer can raise its blade right over and tip things out behind it. Problem solved! 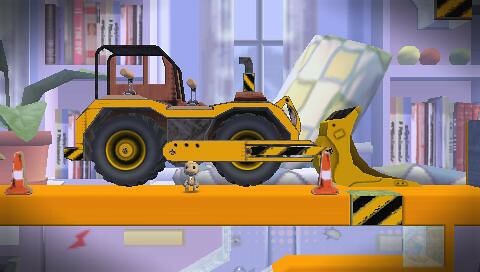 So there you have it: how we made all the vehicles for our construction site level. Next time, I think we’ll do something silly. As we mentioned before, we had so many great ideas for new levels that we couldn’t bear to leave any out! Each level in the ‘Turbo! Pack’ has its own theme. 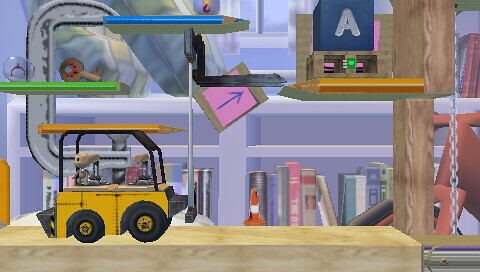 The first was racing, and rather unsurprisingly this level is based around the idea of a construction site so we’ve deliberately made it really cluttered and full of loads of different objects. 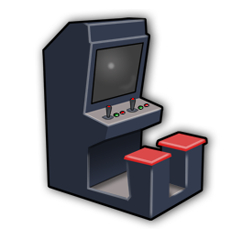 To supplement the vehicles in the pack, we have also created a very juicy range of 3D objects with which to populate the levels. Erasers? Check. Fluffy dice? Check. Along with many other items you might find lying around a kid’s bedroom, these not only look great but they’re great fun to play around with, and we’re sure you’ll come up with loads of ingenious and troublesome ways to use them! This level also introduces not one but two new story characters that are also 3D and can be collected in prize bubbles as their separate components. If you really wanted to there’s a couple of heads you could attach to the crane as wrecking balls… not that we would condone such things! The new theme really started to come into its own with this level, with the use of lots of bright colours and in particular a lovely pale coloured wood. We’ve made an entire set of new materials that hopefully you’ll find as useful as we have done! Amongst other things we’ve also made some materials that look like plastic to really get that “toybox” feel. We really loved the idea of roaming around various objects and pieces of furniture that you might find in a kid’s bedroom, or perhaps exploring the vast unknown that lurks beneath the bed… and this is really reflected in the plethora of new content that we have made. One thing that has been really important is maintaining a sense of scale across all the levels, despite how different they are from each other individually. We did this by reusing key aspects of environment as much as possible, such as the books, coloured table tops and drawers. This also helped to really unify the ‘Turbo!’ theme as a whole. 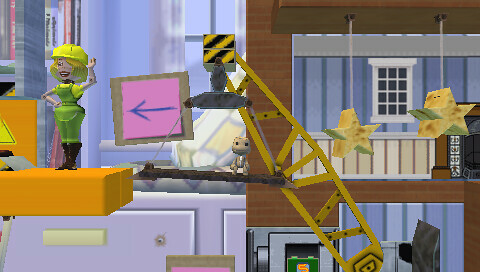 So remember, the next time your parents or significant other (or both) tell you to tidy your room because it looks like a bombsite, be sure to inform them that actually you’re planning an intensely complicated LittleBigPlanet PSP level and that it must not be disturbed under any circumstances. And then maybe hide the vacuum cleaner, just in case. 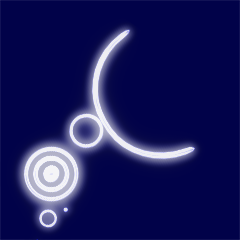 Why is there not more recognition of some of the great user made levels in the game? 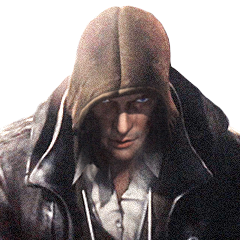 Please add via a patch a section in-game devoted to the hidden gems made by the community. 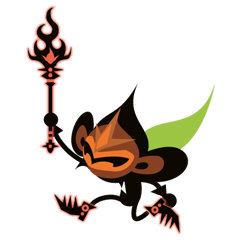 The management of LPB, the missed opportunities, the lack of promotion of the fantastic user-made levels have been a real disappointment. Even a website or section on PSN devoted to highlighting creative and brilliant community made levels would have sufficed.